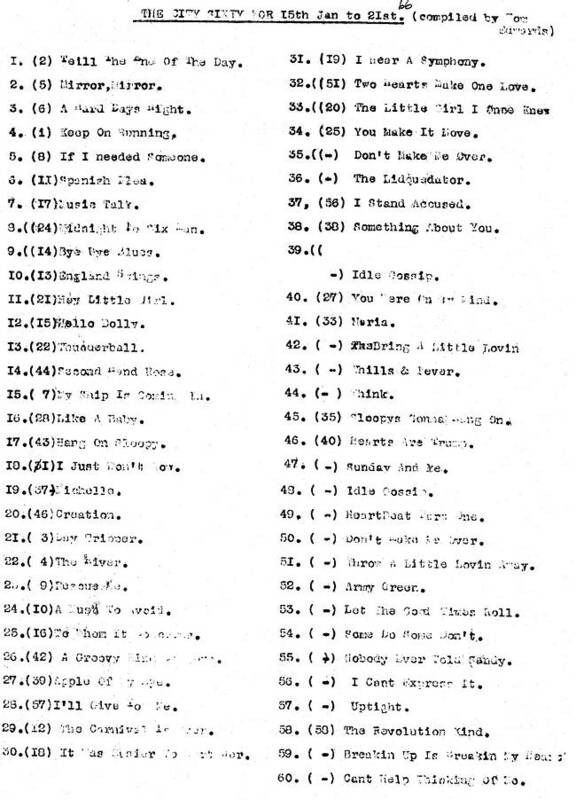 As before, the original document only lists the song titles, not the artists. We have attempted to fill in the gaps but, in some cases, have had to make an educated guess about which track is being referred to. Unlike the previous charts, this one bears the name of the person who compiled it - DJ Tom Edwards. It has to be said that he included some pretty obscure tracks and we have had difficulty identifying them all. If you spot any mistakes on our part, please get in touch. * The same track, Don't Make Me Over, was listed as both no.35 and no.50 on the original document. Next week's chart reveals that it should have been at 35 but we don't know what should have been at 50. ** The same track, Idle Gossip, was listed as both no.39 and no.48 on the original document. Next week's chart reveals that it should have been at 39 and that Love's Just A Broken Heart should have been at 48. *** We think the song at no.42, listed as Bring A Little Lovin', and the one at no.51 listed as Throw A Little Lovin' Away are actually both the same song. Its correct title, as seen on next week's chart, is Throw A Little Lovin' My Way. Also, according to next week's chart, it should have been at no.42. We don't know what should have been at 51. The Caroline South Countdown is here.